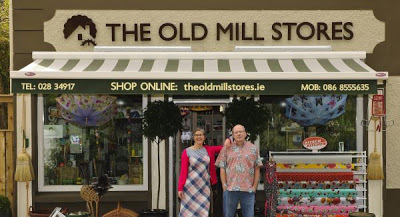 A brush with fame and fortune for this installment of Irish Shops we Love! The Old Mill Stores is owned and run by Claire Graham & Tom Keane. Their stock runs the gamut of goods from hardware to haberdashery and crockery to craft that is high-quality, original and hard not to love. 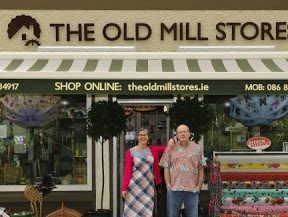 The Old Mill Stores sell high quality, well-designed and sometimes amusing, homeware, gifts, craft, antique stoves and more – from the practical to the beautiful. Their guiding principle is simple – if they like it and think you will too, they buy it! We wanted to sell things that couldn’t be found elsewhere in Ireland, and began travelling to source unusual stock from around Europe. Having brothers in Denmark and Holland made regular buying trips an attractive proposition for us as new styles and ranges were slowly added to the expanding business. We source new goods during our quieter periods — October, November and January. Copenhagen and Amsterdam are wonderful for finding interesting ranges in new design, as well as regular trips to France. Over the months, we became stockists for goods that nobody else was selling here. With stove sales still accounting for a significant portion of sales, The Old Mill received an unexpected, and very beneficial, piece of promotion when three of their models were chosen for the final Harry Potter film. We had become quite famous for our stoves, as we were the only people bringing antique Scandinavian and European stoves and the filmmakers just came across us on the internet. They went on to buy three stoves, and that in turn led to us also being contacted for other stoves by film director Tim Burton. We did get to bring the stoves over to the UK, and while we didn’t get to go on the Harry Potter film set, it was a great opportunity for us to visit a number of markets over there. We would like to develop our own brand range, possibly along the lines of t-shirts, bags, scarves, aprons — a general gift and accessories range. We have a number of design ideas in that space that we see as being very marketable, as well as a possible pop-up shop either in Cork City or Dublin. Allied to that, we are looking at adding more vintage lines to the shop, as well as maintaining and developing our online presence further. The season here in West Cork has certainly started very well for us, and we expect a better summer than last year.